Have you been injured in an accident due to the negligence of another? Need a lawyer for a personal injury case in Walker County? 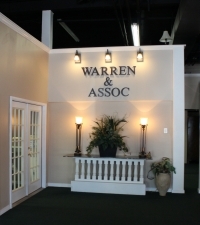 At Warren & Associates, LLC, we can provide you with the skillful and highly aggressive legal assistance that you need in order to effectively pursue the damages that you need. With the right representation, you could be able to obtain compensatory damages for the financial hardships you may have incurred along with your injury. We have been serving the residents of Jasper, Alabama in various personal injury matters for a number of years and are happy to help you with any type of case. Sustaining a brain injury could cause permanent damage and affect a victim's life forever. If you hit your head in an accident and you are currently experiencing headaches, memory loss, dizziness, confusion blurred vision, or fatigue, then you have sustained a brain injury. Suffering a traumatic brain injury then your physical mobility, cognitive functioning, sensory functions and social skill could be impaired. Find out if you are eligible for compensation today by speaking with a catastrophic injury attorney at our firm. Fire and burn injuries can take a very long time to heal and are extremely expensive to treat. Serious burns can also leave scar damage which could negatively impact the victim for life. Learn if you are eligible for compensation for your burn injuries today. We may be able to hold the negligent person responsible for their actions. There are many laws and ordinances in place that govern traffic patterns and speed limits throughout the state of Alabama, and the United States. Violations of these laws can result in serious accidents and injuries. If you are injured in this type of accident, then you may be entitled to pursue damages through a personal injury lawsuit. Manufacturers have the responsibility to produce products that function according to their original intent. If you have been injured through the reasonable use of a defective product, then you may be entitled to collect damages. When a medical professional fails to uphold a standard level of care and as a result injures or kills a patient, then it is considered medical malpractice. Common forms of medical malpractice include medication errors, failure to diagnose or misdiagnosis and surgical errors. People who ride motorcycle are extremely vulnerable when it comes to traffic accidents. There is a very high change that motorcycle riders can sustain catastrophic or life-threatening injuries if they are involved in a traffic collision. If someone else caused your accident, then you may be eligible for compensation. Property owners have the responsibility to keep their land safe for visitors, invitees, and other authorized individuals. When an injury occurs due to the negligence of a property owner to provide reasonable safety or warning, then the victim may be entitled to damages. If you are injured to the point of being unable to return to work, then you may be eligible to collect social security disability payments. Seek the representation of our firm to effectively pursue the results that you need. Suffering a spinal cord injury could leave you physically impaired or paralyzed and unable to walk. Spinal cord injuries, or SPIs, are considered to be catastrophic and they should not be underestimated. These injuries are very expensive to treat and they could least to a number of invasive surgeries, rehabilitation, physical therapy, or life in a wheel chair. Seek compensation for both financial and non-financial damages today! Injured in a truck accident? Due to the large nature of these vehicles, they can cause catastrophic injury and even wrongful death. Let us help you recover restitution by filing a claim against the negligent driver who caused your accident. Work related injuries can result from the negligence of an employer to provide reasonable safety training or equipment, or due to the negligence of a coworker. These injuries can warrant a workers' compensation claim for the victim to obtain compensation payments. If an individual is involved in an accident that kills them, or results in severe injuries that lead to death, then the victim is said to be the victim of wrongful death. If your loved one has suffered from this circumstance, then you may be entitled to compensatory damages for your loss. Injured in an accident in Walker County? We are skilled and experienced Jasper personal injury attorneys, and you can be sure that we will stand by you and work with you toward the results that you need if you choose to work with us. We offer a free case evaluation so that you may obtain some legal advice and information regarding your situation before making any financial commitment to our firm. Our firm has decades of experience and is dedicated to serving residents of Tuscaloosa, Birmingham, Homewood, Mountain Brook, Carbon Hill, Cullman, Cordova, Forestdale, Hueytown, Sumiton and all of Walker County. Need an attorney for a personal injury case in Jasper? Contact us today to discuss your case and to learn more about how we can help you.